Let’s say there are two countries, Country 1 and Country 2, each with a bread factory and two citizens who buy bread from their factory. There is a trade barrier in place preventing the factories from selling to the other country. Each factory makes a profit of $2 on each loaf of bread. The factory in Country 1 earns $4 from its sales. The people spend $40 on bread. The factory in Country 2 also earns $4 from its sales of bread. It’s citizens only spend $20. So, the net expenditure of money in Country 1 is $36, and in Country 2 $16. Now, let’s see what happens if the trade barrier is removed. Everybody now buys from the factory in Country 2. So the factory in Country 1 earns nothing (it sells nothing) but its citizens spend only $20. The factory in Country 2 earns $8 from its sales of bread to four citizens now. The citizens of country 2 spend the usual $20. So, the net expenditure of money in Country 1 is now only $20 and in Country 2 only $12. Economists argue that through this mechanism, the free market benefits all trading parties. But it turns out that not everybody wins if you consider a different model – one that includes businesses shutting down and unemployment. When there are trade barriers, everyone works for the factories in their own countries. With the barriers in place, the factory in Country 1 pays a salary of $20 to its two employees. The factory in Country 2, being more efficient, pays a salary of $40 to its employees. Now the net earnings in Country 1 (earnings – expenditure) are $4 (because the earnings cancel out the expenditure of the citizens, and the factory earns $4). The net earnings in Country 2 are now $64 (because the citizens spend only $10 each while earning $40, and the factory earns $4). Now let’s say free trade is introduced. The bread factory in Country 2 starts selling its bread at $10 in Country 1. The bread factory in Country 1 shuts down (because no one will buy its bread at $20). The citizens of Country 1 who worked for the bread factory no longer have an income. They still have to buy bread to survive (using their savings) but their expenditure is lower not at $20. So now Country 1 ends up with a net earnings of $ -20 (a drop of $24). The net earnings in Country 2 go up to $68 (and increase of $4). So in this model, not only does the earnings of Country 1 go down but also the earnings of the world as a whole (because there are fewer people gainfully employed). However, things don’t stop there. The bread factory realizes that by hiring the citizens of Country 1 to work for it instead of citizens of Country 2, it can cut its cost of production in half (because salaries in Country 1 are half that of Country 2). By doing so, it can start making profits of $6 per loaf of bread. So now you have the citizens of Country 2 facing unemployment (no earnings). So the net earnings of Country 2 drop to $4 (a drop of $64). The earnings of Country 1 on the other hand go up to $20 (a gain of $40). But there is again a drop in the earnings of the world, because though the same number of people are employed, it is higher-paid people who are now out of a job. This is not compatible with a model of free trade that continually improves things for everybody. Of course, I’ve used a very simple model, but it reflects the truth that when free trade is introduced, there are winners and losers and that the weaker parties are the losers. There seems to be a way to predict who the winners and losers in any attempt to introduce free trade will be. In models of military engagements, the principle of force is used to predict the outcome. Given roughly equal equipment and training, the stronger force almost always wins. The reason for that is shown in the following diagram. Let’s say there is a red force with 4 soldiers and a green force with 8 soldiers. Each side fires a shot every minute. Each soldier aims at an enemy soldier and fires, with a 50% probability of hitting his target. After the first volley, the red force would have fired 4 shots and hit 2 green soldiers. But the green force would have fired 8 shots and hit 4 red soldiers. So the losses would be disproportionately higher for the weaker party, and the green force would win the battle with the loss of two of their own. It appears the same model can be used to predict the winners in economics too. In economic models, the contending forces would be firms or employees. Larger and better equipped firms (which can produce cheaper products) can be expected to win (push small firms or more expensive employees in direct competition out of business) in any market where free trade is introduced. For example, before India traded freely with the USA, there were many local soft drink manufacturers (Torino, Thums Up and Limca) in India. When Coca Cola and Pepsi entered the market, all the Indian soft drink brands had to sell out. Similarly cheaper workforces (which cost less to hire) can be expected to win. An example would be the use of immigrant labour in many countries (especially the USA) for agriculture. So, how can a weaker economic segment (be they workers or industry) be protected? Through barriers (barriers allowed by trade agreements). Barriers (something that a force can shelter behind) may be used to protect weaker forces of any kind. Here are a few barriers used in economics. As you can see, barriers to trade are already in heavy use though people talk as if free trade is widely practised. The US workforce in the computer industry being more expensive than an Indian workforce, has been protected by visa and fee barriers. There are visa quotas and a fee levied on Indian firms – to the tune of $5000 per visa for H-1B and L-1 visas). The fee costs the Indian software industry $1 billion to $1.5 billion annually. Not palatable to Indian industry of course, but effective in protecting high-end jobs in the USA. Now what I don’t understand is why the USA uses barriers to protect jobs for skilled people who are highly qualified and quite capable of acquiring more skills and competing on quality. I would suppose that if the USA used barriers, they should probably do so to protect jobs at the low end of the economy (helping out poorly skilled or unskilled workers who’d find it harder to acquire more skills or compete on quality) as India does (through a minimum salary requirement for work visas, which is aimed squarely at keeping out cheaper Chinese labour from infrastructure [say road building] projects). During the colonial era, barriers to the import of Indian products were used to protect a nascent textile industry and jobs in England. Before a British Parliamentary Committee in 1840] Montgomery Martin stated that he . . . was convinced that an outrage had been committed ‘by reason of the outcry for free trade on the part of England without permitting India a free trade herself.’ After supplying statistical data of Indian textile exports to Great Britain, he pointed out that between 1815–1832 prohibitive duties ranging from 10 to 20, 30, 50, 100 and 1,000 per cent were levied on articles from India. … ‘Had this not been the case,’ wrote Horace Wilson in his 1826 History of British India, ‘the mills of Paisley and Manchester would have been stopped in their outset, and could scarcely have been again set in motion, even by the power of steam. They were created by the sacrifice of Indian manufacture. Had India been independent, she could have retaliated, would have imposed prohibitive duties on British goods and thus have preserved her own productive industry from annihilation. This act of self-defence was not permitted her’” (Clairmonte 1960: 86-87). Another example can be seen in the policy of subsidizing the renewable energy industry in the USA and buying renewable energy locally. The use of models to determine winners, as described above, can empower governments to decide which sectors of the economy are most vulnerable to competition (so action may be taken to protect them). Many protective actions can be taken without violating free trade obligations. The best example of a fair protection policy is progressive liberalization. For example, when the Chinese government introduced foreign direct investment (FDI) into the retail sector in China, it did so gradually, increasing the percentage of ownership permitted to foreign owners over 15 years. In the course of the 15 years, local firms learnt the tricks of the retail trade and were able to compete effectively against the new entrants. In contrast, the Indian government went from discouraging the participation of Indian private firms in the railways and defense industries, to allowing 100% FDI in one shot, thus failing to give Indian firms the time to develop the capabilities or technical know-how to compete in these markets, with the result that bullet train and metro rail equipment needs to be imported in entirety (or imported with a ‘made in India’ veneer – assembled in Indian factories entirely owned and operated by French firms). Another policy that could protect and benefit businesses in certain sectors is grants for nascent industries with vast future potential. In the USA, there are small business grants, research grants and subsidies for small firms. In contrast, the government of India seems to have failed to create a level playing field for local startups. I recall many years ago (at the height of the internet boom) when the government of India had a small business grants program, it had a clause specifically leaving out Indian software startups. Somehow the government of India had decided that they would not make research grants available to local startups in the highest-growth industry in India at the time. Here’s more on how the Indian government seems to not be as accessible to local startups as it is to larger global startups/firms competing with them. This is a problem that needs to be fixed. It’s easier for a foreign startup or MNC to get forgiveness for inadvertent violation than it is for a domestic startup (today foreign startups enjoy better access to political leaders and therefore easier forgiveness). Uber got 1.5 years of forgiveness on payments that Ola did not get, and Amazon got forgiveness for having its own supply centres, and not following the marketplace model, which Flipkart did not get. Flipkart had to change its model to comply with the marketplace model. Both Ola and FK were hurt by this favoritism to Uber and Amazon. Another method is to strengthen the weakest parts of the workforce in the face of competition from migrant/immigrant labour. Sponsor education programs (financial-need-based free college/training) to facilitate reemployment in growing industry segments. Revive industries that could employ that part of the workforce in larger numbers (the manufacturing industry). One way to revive manufacturing that might be to create more outlets for US made goods and fund automation of manufacturing. Visa barriers (Indian work visas require a minimum salary that effectively protects less skilled workers). Using regulatory and tax barriers to FDI (as is done in China) to generate scalable revenue for local businesses. In conclusion, I wanted to point out that if governments could start using models such as the one above to calculate who might win in various scenarios involving free trade (instead of assuming that everyone wins), they might be able to formulate better and more equitable economic policies for their citizens. Some governments, such as those of New Zealand and China have opposed FDI (Foreign Direct Investment) in various forms. We examine in this article what their reasons might be. Do some countries reject FDI? It appears that some do. In the USA, there are no serious legal barriers to FDI, but there can be disapproval of and concerted attempts to block FDI. After Honda Motors opened the first Japanese auto plant in the U.S., in Marysville, Ohio, in the early nineteen-eighties, followed by an engine factory in nearby Anna, Ohio, the company faced an onslaught of vicious anti-Japanese ads on TV and in print, often supported by American manufacturing trade and labor groups. The comparably subdued response to Chinese manufacturers speaks, on one hand, to changing circumstances, especially the broad acceptance of globalization in the United States and the desire, on the part of some politicians and business leaders, to create manufacturing jobs by whatever means necessary. But it also follows from a conclusion that American companies have reached about their Chinese counterparts: namely, that they are, thus far, relatively inconsequential rivals. In October 2015, the government of New Zealand blocked the Chinese firm Pengxin’s attempts to buy (through a local subsidiary) a farm called Lochinver. Land information minister Louise Upston told the BBC that its decision in September to block Pengxin’s purchase of Lochinver farm does not mean the country is not interested in attracting foreign investment. “It’s [foreign investment’s] an important part of our economic strategy, but equally when we do have an application for sensitive land and assets – we will put it across the 21 criteria that we need to assess and make a decision based on that,” she says. Dr William Rolleston, president of the Federated Farmers of New Zealand, a group that lobbies on behalf of its farmer members, says some farmers are concerned about the scale of the purchases. “New Zealanders don’t have an issue on ownership at a low level. No one would be concerned if 5% of farmland was owned by overseas buyers,” he says. Dr Rolleston’s sentiment echoes public concern from 2012 when Pengxin bought 16 dairy farms and sparked a debate about national identity. So, it appears that in New Zealand, the government wishes to keep resources such as land in local hands. China seems to have laws that make it difficult for foreign firms to compete with local firms, making it a logical choice for them to outsource the manufacture of their goods to Chinese firms. For example, if you are a Wholly Foreign Owned Enterprise (WFOE), you need to pay the government 20% of the profits of your China operations. First off, in your first year, you are going to essentially waste around $50,000 in just forming your WFOE, securing various government approvals, paying someone to figure out your taxes, and making up for all the mistakes you will make because you will be in, what is for you, a very strange land. On top of that will be your taxes, which you are going to need to pay on just about everything. Figure 20% on profits and even if you do not make profits, figure on them being imputed to you. And figure on having to pay around 40% to various of the Chinese governments as taxes on the salaries you pay your employees. I said that there is a good chance the Chinese manufacturer is paying half of its employees completely under the table and reporting to the government only half of what it was paying the other half. I then talked of how there is also a good chance the Chinese manufacturer is underpaying its taxes and of how its rent also may be paid under the table. I then said that this sort of thing may be all well and good for Chinese companies, but that if the US manufacturer were to buy this Chinese manufacturer, it would need to do so as a WFOE and it would then immediately be on a “whole ‘nother level” with respect to China’s various tax authorities. Joint ventures with Chinese firms on the other hand apparently are difficult to retain control of. This explains why Apple, instead of running its own factories in China, outsources the manufacturing to a Chinese firm – Foxconn. So it appears that China, through its taxation mechanisms and through selective enforcement of its laws, deliberately blocks FDI into China. Numbers show that in the past few decades, China received considerable inflows of FDI. However, much of that FDI is attributable to Hong Kong (Hong Kong’s share of China’s FDI was 55% – ten times that of the USA). The imbalance in FDI numbers can be seen in the following table taken from an out-of-print volume from the National Bureau of Economic Research in China. So, it is evident from the above that most of China’s 1990s FDI came from Hong Kong and therefore was not really Foreign DI. So, what benefits does blocking FDI give to a local area? Might barriers to FDI help economies? In the case of China, the advantage seems obvious. If foreign investors could open their own factories, they would hire Chinese labour and be able to own the scalable income from the proceeds of manufacturing, passing on only the salaries (which are low in China) to their employees in China. It is only the inability of foreign investors to purchase and operate Chinese factories as cheaply that forces them to outsource to Chinese firms. So, the barriers to FDI in China help drive business to Chinese firms. These policies can also force the transfer of technology to local firms. Contrast this with the case of India. India had a similar boom driven by cheap labour in the form of software services. There were hundreds of small, medium and large firms in Bangalore offering software services to the financial sector in the USA. However, a trend I have seen in recent years is for US firms to buy up medium-sized software firms in India and get their software related work executed by these now captive software teams than to outsource work to Indian firms. So, the inability to get work drives many local IT services firms to sell their operations to US-based firms. This effectively reduces the total revenue earned locally to just the salaries paid instead of salaries+profits. I am not certain of how the numbers compare with the boom years but I think the absence of a road up the IT services value chain results in the middle being cut out, leaving only the very large firms and a host of relatively tiny shops in the local IT services market. So, had FDI barriers existed in the software sector, it would have forced foreign consumers of IT services to access Indian programmers through an Indian corporate entity, increasing the share of the pie that accrued to the local economy, and increasing the quantity of business opportunities for local IT firms. Take the case of New Zealand again. The argument put forth by the government there is that they need to keep control of land (a scarce resource in New Zealand). In other words, the restrictions on FDI are meant to allow local firms the retain control of revenue generating resources. Contrast this with the software industry in India again. In software the key resources are human resources (the engineers). And around the world, software engineers are a scarce resource. There was no barrier to FDI that would allow local firms to compete with foreign firms (which could pay more because of their stronger currencies) for those resources. The result seems to be a stratification of software engineering resources by capability. The engineers with the best skills (who could effectively develop products) mostly ended up in American software firms and can be paid salaries in the range of Rs. 60 lakhs per annum. Engineers with less valuable skill-sets (who can at most configure, install, test or maintain products) seem to gravitate to Indian IT services firms where salaries seem to stagnate at about a quarter that amount. This flight of resources might have contributed to preventing forays into product development by software services firms in India. So, in a sense, by providing outside firms direct access to scarce resources, the opportunity to make a lot more money might have been allowed to slip away. In conclusion, it may be said that sometimes, a clever use of barriers to FDI seems to help extract more revenue (by blocking access to valuable resources) and thus create larger surpluses for local businesses. Those surpluses in turn help build more infrastructure and capacity and improve the economy. The case of China, contrasted with that of India, seems to illustrate the case where such barriers might have been beneficial to the economy. Direct democracy can be broadly interpreted to mean the control of the allocation of common resources by the people who pooled in. One common resource is tax money. In most countries, those who pay taxes only have a say in whom they can elect to power. Those who pay taxes rarely have a say in how the tax money is spent. There is a middleman (someone who works in government) who decides how the tax money is spent. The problem with having a middleman decide the allocation of common resources, is that the resources could end up being allocated very inefficiently due to man-in-the-middle corruption. The way out is to let the people who contributed to the common pool decide on how the resources are allocated. One way to do this is to embed direct democracy mechanisms into the contribution mechanism. For example, tax-payers could be given the ability to tie a portion of their tax contribution to expenditure categories. They could be given the right to apportion, out of every $100 that they have paid in taxes, a certain amount to each of the following major categories: education, healthcare, social security, infrastructure and defence (leaving a certain percentage to the finance minister’s discretion). It could also be left to the tax-payers to specify how much money the government may borrow on their behalf. This direct control could very likely have prevented the debt crises of Greece and Ireland (and especially in countries where people are averse to taking on debt), and might also have given people in the USA some control over their government’s borrowings. Another mechanism is the referendum. It is already being used in all democratic countries, but mainly for the selection of the middleman. Fortunately, things seem to be moving well beyond that stage. In India, baby steps are being taken towards bringing about a direct democratic model of government. A new political party came to power in Delhi on an anti-corruption platform. The first thing they did was conduct an informal referendum to ask the people of Delhi if they should form a minority government. So, referendums are one of the mechanisms of direct democracy. This mechanism can also be used to prevent or reduce man-in-the-middle corruption. Take the example of a road that needs to be surfaced. Normally, a government official would have issued contracts based on the bribes paid to him by the contending contractors (rendering a selection on the basis of quality very unlikely). If instead, the people living on the street that needed to be surfaced had been given all the relevant information needed to make a good choice and asked to select the best contractor for themselves instead, the middle-man would have been eliminated and the quality driven up instead of down. Now, I am going to talk about some problems that I think affect research funding in the USA (and other countries with government-funded research). Most research funding in the USA comes from government bodies like the NSF, the NRO and DARPA. Now the following is only my personal opinion, but I think that research efforts in some fields in those countries might be distorted to some extent by the needs of these funding bodies. Well, I can only speak for the research areas in which Aiaioo Labs is active. We focus on a narrow research space – predominantly on text analytics and natural language processing. In this space, I see a lot of low-hanging fruit that nobody in the USA or Europe ever picks. And that’s quite inexplicable as these are often problems with very obvious applications to the software products space. And yet I see no papers from California on them. There are topics on which all the papers I see are from India (often by students who don’t even publish them in international conferences) and sometimes by researchers from Singapore – completely ignored by the main research community. At other times, I’ve noticed areas of research that DARPA had spent much money on in the 1970s and that researchers had pursued very enthusiastically in that decade. I’ve seen those lines of research being abandoned in the 90s (possibly once the funding priorities changed) and not being revived again, though product firms are working on those technologies again in California in 2013. I find it hard to explain why these areas of research are being ignored, except by the remote possibility that they have passed under the radar of the guys in the Naval Research Office which makes it unlikely that grants will be provided for them. That is again, if my conjecture is right, a man-in-the-middle problem. The agenda for research is possibly not being driven by the research community or by the market (the needs of start-ups in California) but by people guessing at what sort of proposals might get funded (and that might be encouraging people to stay with what government knows). Here, each of the participants (researchers) bidding for the grants would put in suggestions about what the next important thing to focus on as a research community might be. Then they could all vote on the suggestions. The allocation of research grants could then be guided by the suggestions and the votes received by each suggestion. There is a nice article on Wikipedia on direct democracy. The article talks of two of the control mechanisms proposed in this article – referendum and initiative (which corresponds somewhat to suggestions) – and proposes one that I hadn’t mentioned – the right to recall. It doesn’t talk about apportioning. Here is an interesting video of a Mohalla Sabha (it’s an interesting participation mechanism that a political organization is experimenting with in Delhi). There are really two types of corruption. In India, bureaucrats sometimes deliberately delay the processing of applications in the hope of getting a bribe. A citizen who needs, say a water connection, has to pay a bribe to a clerk to get their application looked at. If you are the victim of a crime, and go to the local police station, the policeman will expect a small bribe to register your complaint. This seems like a fairly harmless form of corruption. Some people defend it as necessary in a free market, as a mechanism for the differentiation of services. It actually seems very like a tip. But in this case, you have to pay before you get the service. But if you take a closer look at this form of bribe and think about the economics of it, you see that what is being demonstrated is a form of rent-seeking behaviour. And you will see that it has the harmful side-effect of encouraging inefficiency. As time progresses, the processes get slower and slower and newer hurdles and pain points are introduced to make people fork out more and more money, and everyone ends up losing – paying a heavy price for encouraging such practices – because of the resulting inefficiencies. If there’s one take-away from the above discussion, it would be this: in this form of corruption, the inefficient people get rewarded, and you end up encouraging inefficiency. The second kind of corruption is the man-in-the-middle kind of corruption. This is the corruption you encounter when people’s money passes through the hands of a middle-man tasked with procuring services for them. In the realm of public services, like the construction of roads and schools, that middle-man is government. In the presence of corruption, the middle-man ends up selecting the service-provider who pays the highest bribes, not the service-provider who does the best job. This leads to a market where the lowest-quality service provider wins. Economic theory also suggests that this drives the highest-quality vendors out of the market. That conclusion follows from the work of George A. Akerlof. He described it in a paper titled ‘The Market for “Lemons”: Quality Uncertainty and the Market Mechanism’. In the case of India, it is possible that the migration of computer scientists and engineers out of India can be explained in part by the pressures of such a process. We can also compare the two forms of corruption in terms of how damaging they are. Let’s say that a citizen needs to get a job worth X dollars/rupees done. He needs to pay a bribe that’s usually of the order of 3% to 10% of X. With the cost of the bribe factored in, the value/expenditure ratio is above 90%. So, the loss is small. If we count the money taken as a bribe as a benefit to society (assuming the bribe-taker uses it well – maybe he donates it to charity) then the value/expenditure ratio is 100%. So, speed money corruption doesn’t hurt too badly. It leads to a small loss if any per transaction. Things are much worse (much more damage is done) when a middleman decides to spend the money that you pooled in (tax money) injudiciously. So let’s say X dollars/rupees of our tax money is in the hands of a middleman. Let’s say the middleman takes a bribe from a vendor to buy something worthless (I’ll give you some examples of this shortly). The middleman who made the purchase would get 3% to 10% of the value of the sale from the crooked vendor (this is called a kickback). Now assuming the middleman spends the money he gets very well (let’s say he donates it to charity), that is the only value the tax-payer gets for the transaction. So, for X dollars spent, the taxpayer gets a maximum benefit of X/10. That means the value/expenditure ratio is less than 10%. Now, here are some examples of possible cases of man-in-the-middle corruption in India. There is an article in the BBC titled “India scraps $753 Finmeccanica helicopter deal“. It is about the purchase by the Indian government of 12 helicopters for transporting VIPs at a cost of $753 million. Each helicopter cost around $60 million. The kickbacks paid are estimated to be a whopping $67.6 million. In comparison, the cost of India’s space mission to Mars is $73 million. So, Indian officials were willing to pay as much for a helicopter as it would cost to fund a space mission to Mars. The helicopters were also quite useless because there are thousands of military helicopters already in use in India to ferry VIPs. The argument that the Generals who bought the helicopter put forth was that the helicopter would allow the bodyguard of the Prime Minister to stand upright while accompanying him to landings at high altitudes. That would have been an expenditure of 753 million dollars for a value of 67.6 million (provided the officials used the bribe money well) which is a less than 10% value/expenditure ratio. This is why man-in-the-middle corruption is particularly dangerous and damaging. It can lead to a country’s resources being siphoned off without conferring any benefits upon the country. Another example I can give you is that of the excessive expenditure over the last few years on the import of arms. And the Indian government is spending so much money on weapons imports while running a deficit (India is borrowing money to finance I believe 50% of its budget). What is scarier is that the Indian central government’s annual education budget is only $12 billion, at a time when there are 400 million Indians who don’t get a basic education, and when India graduates less than 100 computer science PhD students each year (thousands of Indian students go overseas for graduate studies). But it’s actually much worse. More than 250,000 farmers have killed themselves since the mid-1990s — a figure that may be a fraction of the truth as local authorities willfully misreport “accidental” deaths. Every second child born in India is malnourished. Nearly two million children under the age of five die every year from preventable illness as common as diarrhoea. Of those who survive, half are stunted owing to a lack of nutrients. The national school dropout rate is 40 per cent. The above numbers highlight the dangers of man-in-the-middle corruption and make clear why it is imperative to put a stop to it. We can see from the above that both types of corruption lead to inefficiency, but the second type of corruption can lead to the large-scale misallocation of tax money (leading to poverty, hunger and death on an unimaginable scale). Can trust affect the outcome of political events (war), business transactions (pricing) and economic affairs (poverty)? This is a problem that I’ve been very interested in for many years. A few years ago I came across papers in economics and game theory that supplied the mathematical tools that we need to analyse such problems. So, I’ll take each area of interest 1) politics 2) business and 3) economics and explain how trust matters in each case. Can the outcome of something like war be determined by trust? Let’s assume an army of 2 soldiers. The first of the two numbers in the matrix represents the payoff to soldier 1. The second of the two numbers in the matrix represents the payoff to soldier 2. (The soldiers win something (represented by 5 points) if their army wins; they win nothing if their army loses; and they lose their life (represented by -5 points) if they do not flee and their army loses; we assume the army wins if both soldiers do not flee and loses if one or both flee). If soldier 1 trusts soldier 2 not to flee the battlefield, the best strategy for soldier 1 is to stay and fight as well (since he will then get more benefits than if he flees). If soldier 1 does not trust soldier 2 to stay on the battlefield (if he suspects that soldier 2 will run away), then the best strategy for soldier 1 is to run away himself (so that he does not remain on the battlefield and get killed). So, this model shows that if two equal 2 man armies meet on a battlefield, the one whose soldiers trust each other more will win. There is a very interesting paper by George A. Akerlof (‘The Market for “Lemons”: Quality Uncertainty and the Market Mechanism’). It tries to explain why the price of a new car in a show room is so much higher than the price of a new car in the second-hand car market. For example, a car costing $25,000 fresh out of the showroom, might fetch $18,000 if sold as a used car in the used car market. Akerlof’s paper tries to explain why the price dropped so sharply. Akerlof suggests that the price drop is a result of the uncertainty surrounding the quality of the car in the used-car market. A certain percentage of cars in a used-car market will be defective (since anyone can sell a car in an unregulated market, and unscrupulous people would have put defective cars up for sale). Let’s say 50% of the cars in the used car market are defective. Now, a person buying a used car a day old will only be prepared to risk paying 50% of the showroom price for the car (because of the 50% chance that the car is worth nothing). The more a person trusts a seller, the higher the price he will be willing to offer for a car. I’ll give you an example of that. (I’m sorry, but this is a bit racist). When I was a student in North Carolina, and I was looking to buy a used car, I was given the following piece of advice by my fellow students. I see the same effect even when doing business in India today – a lot of business happens through connections. 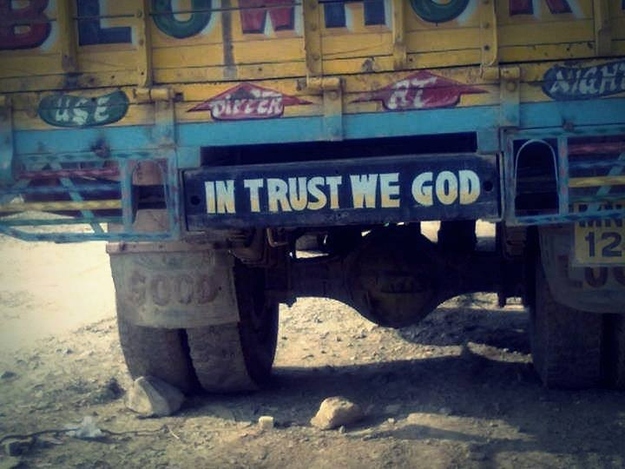 It might also explain why Indians are so price sensitive. Indians are said to be very price-sensitive, preferring the less expensive offerings over more expensive ones that promise better quality (I recall Richard Branson said that at one point while explaining why he didn’t want to enter India). I think the price sensitivity is a result of Indians not being able to trust promises of higher quality from their countrymen. Price becomes the only measure that Indian buyers are able to trust to when making a purchasing decision, leading to extreme price-sensitivity in the Indian market. Even in hiring, this can have the effect of driving down salaries. When hiring someone, an Indian firm is likely to offer a lower salary than the market, because they don’t trust in the abilities of the person being hired. In Akerlof’s paper, he talks about a side-effect of a lack of trust. He says that good quality cars will just stop being sold on the low-trust markets. The applies to the job market in India as well: Indian firms tend to offer lower salaries, which might lead to the best engineers choosing MNCs over Indian firms or leaving Indian shores altogether. I’ve described in an earlier blog how man-in-the-middle systems of government can fail to work efficiently if the man-in-the-middle is corrupt. I’ve described in that post how resources can be wrongly allocated in the presence of corruption. The result of an inefficient allocation of our resources is poverty. For example, the Indian government has tripled defence spending in the last 10 years – through heavy borrowing – when it is possible to show that we need to allocate whatever money we have to education (see our arguments for that https://aiaioo.wordpress.com/2012/06/04/algorithms-to-combat-poverty/). World Bank studies (that you can get off an Indian Reserve Bank website) show that corrupt governments spend more on arms (because of how easy it is to hide kickbacks from arms deals) than honest governments. So, the economic prosperity of a country can be impacted by corruption. I’ll try to show right here that it is a lack of trust. Take for example two players in a bidding war (let’s say that they are bidding for a government contract). Each has the choice to give a bribe or not to give a bribe. Player 1 is more likely to give a bribe if player 1 does not trust player 2 to not offer a bribe to the government official. It’s the same decision matrix that I have used for the case of the 2 soldier army. I am probably way out of my depth on this, but the ancient Greeks seem to have had two views on the supreme ideal that man should strive for. But the above models seem to suggest that truth (honesty) results in trust (you know that the guy next to you is honest and won’t lie about the quality of a car or bribe a government official to get ahead of you). And what the Akerlof paper shows is that trust rewards and promotes quality. In other words, the two Greek concepts of quality (of the values mankind must uphold for its own good) are probably one and the same. 4. Can economics change the world? 5. Is there an algorithm to combat poverty? 7. Is 5 very far from 4? 2. Does AI have Buddha nature? [The image in this picture was taken from a circulated Facebook post. The copyright owner of the image is unknown at this time and if anyone knows him/her I’d like to make sure they’re ok with my using the image and acknowledge them]. A friend shared a study by Berkeley’s psychology department on how wealth or a feeling of being wealthy can make people exhibit less empathetic behaviour. The video explains the research in a very accessible and easy-to-understand manner. I suppose that’s a pretty good explanation of the behaviour. If you’re wealthy and don’t think you will need another person’s help some day, you don’t need to be very helpful to people. On the other hand, if you’re not wealthy and feel insecure about your own future, you might feel compelled to try and be nice to people around you since you might need their help one day. An interesting experiment has been going on in the city of Auroville (an ‘international city’ set up through a UN charter in India to promote understanding among people of different nationalities) (oh, and on the lighter side, I wonder if the internet hasn’t made Auroville totally redundant) and this experiment has been going on for about a hundred years. 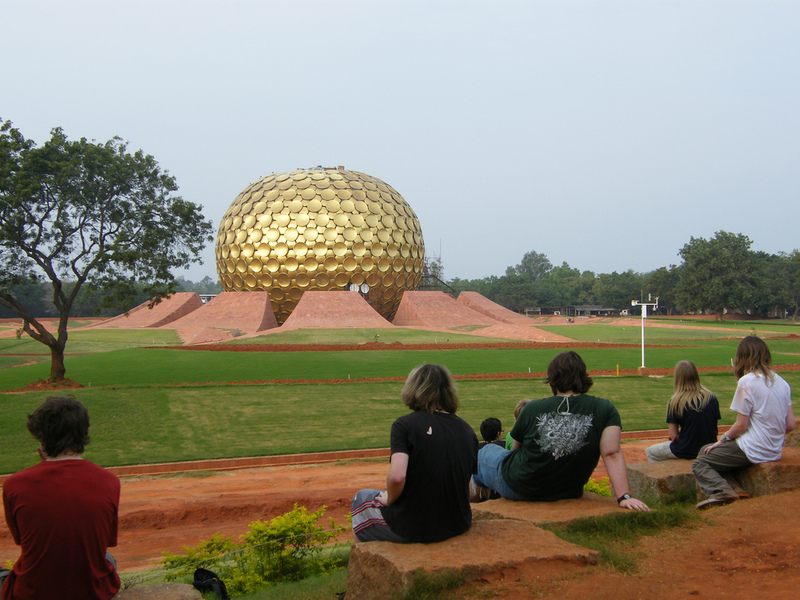 The hypothesis of the founders of Auroville was that if people from different parts of the world came together and meditated together, they would enter a higher plane of consciousness, and influence humans all over the world so they would all evolve into something better than themselves, and would all realize that war was futile, and then war would become a thing of the past. I believe they have been meditating away for the last century. I wonder what they think of the founding hypothesis of their city. But what I found very interesting in the dream of Auroville was the idea that meditation could change the mind – could change society – could change humanity – could change the world. Are there really tools that can change society? Are there tools for the mind? I think that they are the tools of the mind, the tools for large-scale change, because they can be used to figure out a) what about the world needs to change, and b) how to change it. A few years ago, there was a lot of discussion in India about whether corruption should be legalized. Many Indians felt that everybody was corrupt and dishonest. So, if we were all doomed to dishonesty, why fight the reality of our existence? So some chap asked the question – why should we not legally sanction corruption, and make corruption ok? Given a question like that, you can use the three tools I have listed to come up with an answer. It turns out that it would be a terrible idea to legalize corruption. And the answer comes from economics, as the following example will show. There are really two models of corruption. Both as you will see, can be harmful. In India, bureaucrats sometimes deliberately delay the processing of applications in the hope of getting a bribe to move the file along. A citizen who needs, let’s say a water connection, has to pay a bribe to a clerk to get their application looked at. This seems like a fairly harmless form of corruption (some people defend it as necessary in a free market, as a mechanism for the differentiation of services). But if you take a closer look and think about the economics of it, you see that what is being demonstrated is a form of rent-seeking behaviour. And you will see that it has the harmful side-effect of encouraging inefficiency. Just remember one point here. This form of corruption rewards the least efficient worker. This leads to a market where the lowest-quality service provider wins and the higher quality providers leave the market altogether. This last bit is actually an application of economic theory. It follows from the work of George A. Akerlof. He described it in a paper titled ‘The Market for “Lemons”: Quality Uncertainty and the Market Mechanism’. So, we see that using economics theory, we can show that it would be a terrible idea to legalize corruption. You can also change lives, society, and humanity using these tools. Some months back, we had written an article about poverty in India. We came up with a model to describe possible causes of poverty, and suggested a solution. The solution required the use of algorithmic complexity theory. Game theory and computational social science are useful as well. Game theory was the subject of the research of the two Nobel Prize winners of 2012 – Alvin Roth and Lloyd Shapley. In a BBC article on Roth and Shapley the economics editor of the BBC, Stephanie Flanders is quoted as saying “In the past 50 years, game theorists – and micro-economics in general – have genuinely made the world a better place”. Another BBC article tells you about how Roth and Shapley’s work on the allocation of resources can be applied to solving real life problems. Again, quoting Stephanie, “Mr Roth helped New York City redesign its system for allocating children to public school places”. Finally, on to the really new field of computational social science. This is a field that has only been in existence for around 10 years now. Some of the papers Kleinberg has written include ‘How bad is forming your own opinion?’ and ‘You had me at hello: how phrasing affects memorability’.